Games > Garry's Mod > Forum > Garry's Mod Server Administration & Help > Server Reported for False/Idle Clients? 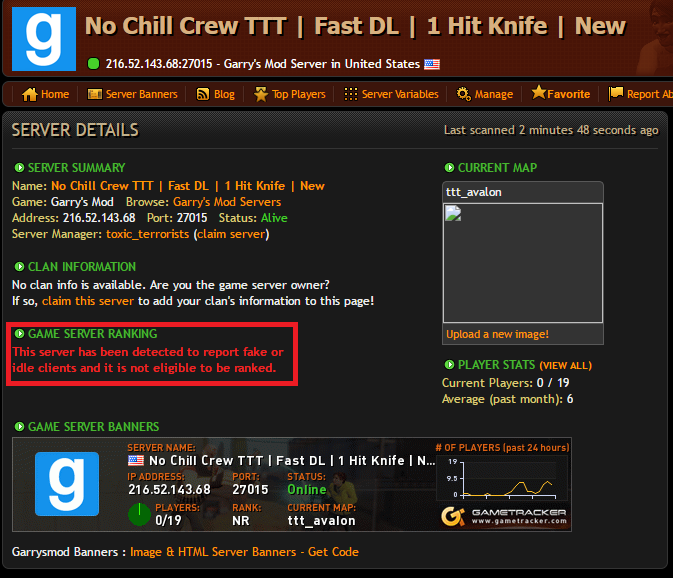 Forum Home > Garry's Mod Server Administration & Help > Server Reported for False/Idle Clients? Not sure why my server was hit for false or idle clients. Only thing I can think of was before me adding an AFK tracker I did have a few players AFK on it over night to grind hours. Another instance could be I used bots in the server while I was coding it to test the gameplay. Or it could happen because the actual player slot is 20 but I have 1 reserved so it only shows 19. I don't know really why it was reported, or even when. I didn't know what else to do besides make a forum post here. Screenshot: https://i.imgur.com/S51G2ks.png Game Tracker Server Link: https://www.gametracker.com/server_info/216.52.143.68:27015/ Not sure why my server was hit for false or idle clients. Only thing I can think of was before me adding an AFK tracker I did have a few players AFK on it over night to grind hours. Another instance could be I used bots in the server while I was coding it to test the gameplay. Or it could happen because the actual player slot is 20 but I have 1 reserved so it only shows 19. I don't know really why it was reported, or even when. I didn't know what else to do besides make a forum post here.